The Government Accountability Office (GAO) released a June 2012 report with findings that almost a quarter of the approximately 7 million children who were uninsured in January 2009 will not be eligible for Medicaid, the State Children’s Health Insurance Program (CHIP), or the new premium tax credit under the 2010 Patient Protection and Affordable Care Act (PPACA). These children have family incomes that are too high to be eligible, are noncitizens, or have access to affordable employer-sponsored insurance through their parents. 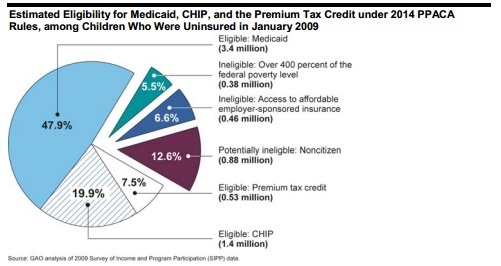 The 6.6% of children ineligible for the premium tax credit was determined per the Internal Revenue Service’s proposed affordability standard rule which says that workers and their families are ineligible for the credit when an employer offers affordable health care coverage through a work plan. According to the IRS rule, employee-sponsored insurance is considered affordable if the cost of the plan does not exceed 9.5 percent of household income. However, this applies to what an employee would pay for a self-plan, not the cost of covering an entire family. The GAO also estimated that about 14 percent of children, who in January 2009 met the 2014 PPACA eligibility criteria for Medicaid, CHIP, or premium tax funding, saw a change in household income over the year which would affect their eligibility. Some states do not have policies that allow children to remain covered under Medicaid or CHIP for a full year should they become ineligible during the year. Families with recurrent eligibility changes might have an incentive to not enroll in these programs due to the onerous paperwork when changing enrollment. An estimated 460,000 children are affected by the IRS’s affordability standard rule. Furthermore, changes in family income during the year could affect almost 750,000 children and their ability to remain in Medicaid, CHIP, or premium tax credit programs. It appears that there are some cracks in PPACA that need to be addressed.